Sonnet’s eGFX Breakaway™ Boxes are a family of Thunderbolt™ 3 to PCIe card expansion solutions that support any Thunderbolt compatible PCIe card, but are designed specifically for bandwidth-intensive AMD and NVIDIA® graphic video cards. The eGFX Breakaway Box 650 features two 8-pin (6+2 pin) auxiliary power connectors; supports cards requiring 375W of continuous power plus an additional 100W peak power (equivalent to 750W recommended system power); and provides 87W of upstream power, useful for charging your notebook. AMD approved for the air-cooled editions of the AMD Radeon RX Vega 64, Vega Frontier Edition, and Radeon Pro WX 9100, this model was designed and qualified to also support overclocked NVIDIA cards with high peak power requirements. Depending on your OS, there's a graphics card suitable for your needs. Thunderbolt 3 provides eco-friendly power features to help save power and energy when your computer is not in use. 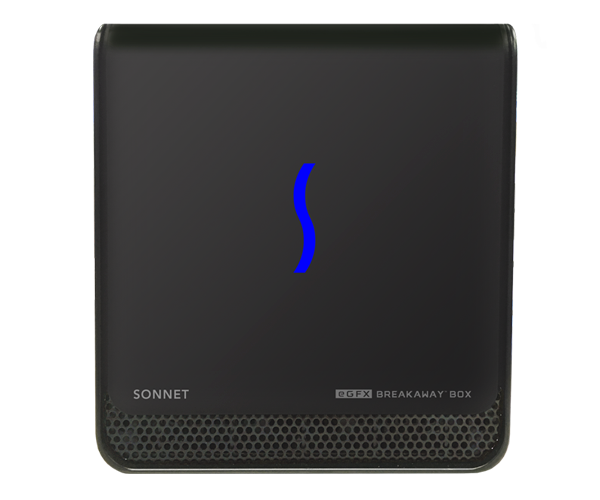 Sonnet's eGFX Breakaway Box, like all Thunderbolt devices, powers on when connected via a Thunderbolt cable to a live Thunderbolt computer. This features allows the Breakaway Box to power down and save energy when the computer is shut down, disconnected, or put to sleep. As a bonus, the device still provides power to charge most computers even when the computer is sleeping. Thunderbolt 3 Power Delivery (PD) allows devices to power and charge notebook computers. The eGFX Breakaway Box 650 provides 87W of upstream power, useful for quickly charging your notebook. Sonnet's Breakaway Boxes boost the graphics performance of an eGFX-compatible computer by connecting a high-performance desktop GPU card via a Thunderbolt 3 port. Add your choice of compatible graphics card to the Breakaway Box and connect to your computer with a Thunderbolt cable. Alternatively, if you need a cost-effective Thunderbolt expansion system for a Thunderbolt-compatible, non-GPU PCIe card (such as the Avid Pro Tools|HDX [power adapter cable sold separately] or RED ROCKET-X), the Breakaway Box offers all the space and power you could possibly need for single PCIe card expansion. Computer notebook and displays shown for illustrative purposes; not included.